The medieval neighbourhoods of El Born and La Ribera have achieved a near perfect combination between past and future. Here you can find the latest fashion trends intermingled with Gothic architecture, and dine on futuristic dishes in a medieval palace. Walking through its streets means being open to the new, but also letting yourself be carried along by history, which is all around you. Walking aimlessly through the streets and squares of El Born and La Ribera transports you back to the Middle Ages, when this area was one of the city's main districts, full of palaces and mansions built by the wealthy merchants. With imposing Gothic precincts like La Llotja, the exchange where they conducted the business that kept them going, but also numerous humble artisans, guilds and sailors who, in only 55 years, and without the help of the powerful classes, were able to build the Santa Maria del Mar church, the best example of Catalan Gothic architecture. In 1714, the medieval district suffered the defeat in the War of Succession, and was severely damaged. In remembrance of those who fell in this war, a flame is kept burning in Fossar de les Moreres, next to Santa Maria del Mar. If you want to learn about the history of that time you should go to the Born Cultural Centre, a Modernista market converted into a museum which houses the remains of the city that disappeared under the bombs. La Ribera was, and still is, a neighbourhood of contrasts. 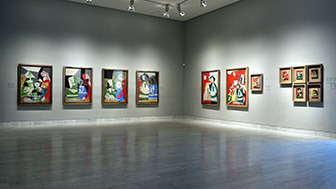 Today, the palaces in Carrer Montcada, old mansions, are occupied by museums and art galleries, the most notable being the Museu Picasso, which holds the early work of this painting genius. Picasso had his workshop in the neighbourhood, as did the painters Rusiñol and Casas. In fact, there were so many artists who set up in La Ribera and El Born that these neighbourhoods were considered to be Barcelona's Montmartre. The legacy of this can still be seen today, as many new creators have moved into iconic spaces, where new trends are found side-by-side with medieval remains and the memory of traders and merchants. It has become one of the most modern and cosmopolitan neighbourhoods in Barcelona, with the hippest fashion showrooms found alongside gourmet shops and the latest trends in restaurant culture. 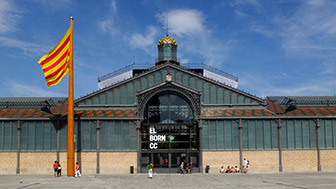 The El Born CCM displays invaluable archaeological remains discovered in 2001.